There are songs I associate with moments in my life. Like Autumn Leaves, She Loves You, and I Still Haven’t Found What I’m Looking For. And then there’s the song that reminds me of James. Killing Me Softly With His Song. When I hear it, my heart becomes immersed in a firestorm of melancholy. A bittersweet fragrance of love and longing and what could have been, ricocheting between my heart and my soul. 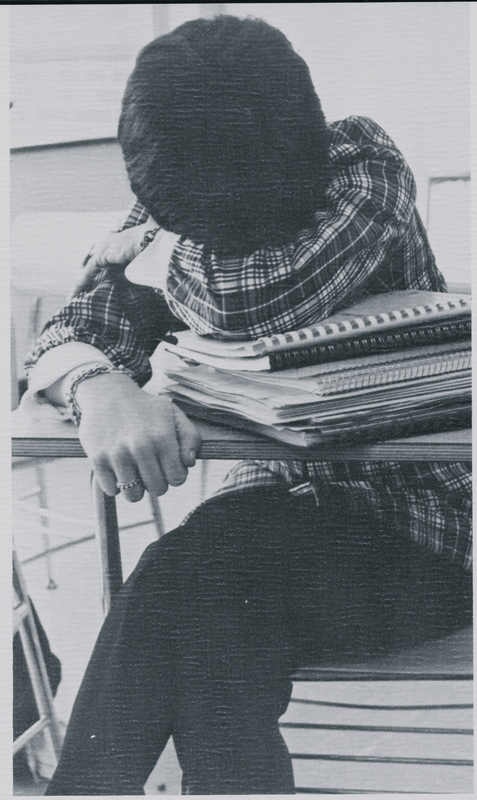 Photo, courtesy of my high school yearbook. Each time I hear the song, I am once again 17, laying in the crook of his arm and he is holding me close. I can feel his fingers curling around the tendrils of my hair that fall loosely around my face. We are forever young. Forever with our entire lives before us, and wishing we could stay like this for five more minutes. So many ways I loved him, but never was it enough. Not for me. In college I learned important life lessons–on growing up, on relationships, and on being on my own. And during those years, after I had settled into my dorm, and James had enrolled in a school three states away, we began a correspondence. I would look forward to his letters that described his life, his classes, his new girlfriend. We found our own way to stay connected, never talking about the past or what happened during my senior year. And then one day, during the summer after my graduation, I saw James one last time. And when I did, he was killing me softly all over again. James. My beautiful boy. The ache in my heart is real. What happened? Why did your letters stop? Did I forget to respond to your last one or was it you who stopped? How did we drift away from each other in the end? Maybe the answer is in the last day we saw each other, when I was just out of college, still living in Boston, and you were living in Manhattan. I met you in the city for lunch. You were taller now, more confident and relaxed. A tall drink of water in your jeans and white tee. It was a warm sultry day and frankly, I had no appetite. I was too excited to see you and not knowing what the next move would be. We lunched on sandwiches and chips, but I barely touched my plate. I was in your presence, James, don’t you get it? We were just catching up. That’s what we did. You told me how you were planning on medical school, and I was getting ready to study journalism. You mentioned having a girlfriend, and I told you about the guy I was living with that summer. As we talked, it didn’t take long for the sparks to ignite once more. But when lunch was over and we stood up and were out on the sidewalk again, something happened. You felt it, too, James. And you took me in your arms and held me tight. We kissed and then we kissed again, your lips lingering on mine. You said your apartment was nearby. We could walk and be there in less than five minutes. Which is what we did. And we spent the rest of the afternoon making love like we never could before. Not then. But it was different now. We were both of age and the worries of youth fell away as we held each other under the blankets in your apartment in the city. There were no mothers to discover us and bring an end to our passion. Instead, there was an attraction, wild and deep. The clock kept ticking and soon it would be time for my train back to Boston. Too soon we said our goodbyes in Grand Central Station. A forlorn gaze in your eyes. It had been four years since high school, and you were still pushing your long hair out of your eyes. We hugged one last time, and I know you were already regretting it. Still, you watched as I walked away, becoming an insignificant dot in the crowd. I kept turning around to see if I could spot you, and noticed that you hadn’t moved at all, your feet firmly planted just were I had last left you. It’s painful to remember how much I loved you that day. Only I was too afraid to tell you. Too much time had gone by. What is it they say? Oh yes, I was a day late and a dollar short. That’s what it was. Well James, to this day I’ve kept your letters. I’ve read them so many times that the paper is worn thin in places, the ink smudged. I treasure these mementos, James. They’re all I have left–proof that once we were. It’s sad that nobody writes letters anymore. Sedaris is right, for I once thought I’d one day meet someone else as good as James, and as true. But alas, a love like that comes along once and trying to recapture it is like trying to capture lightning in a jar. Thanks for reading, and to all, a very Happy New Year. Thanks for reading, Hayley. I really appreciate it, and I’m glad you enjoyed the series. But, sadly, it’s probably going to be a long time before I do another one. They’re very time intensive. What a perfect ending to Lightening in a Jar. Sad and poignant. That song gives me goosebumps each time I hear it. I understand what it means to you my dear friend. I related to the previous chapter – Grace of God so much, maybe you and I will talk about it someday. Oh Monica, I find your writing soothing, easy to fall into, your words rise and speak – truly it is a gift. I would love to talk one day, MM. Just let me know. You know where to find me. That song is very precious to me. So haunting, so poignant, so painfully exquisite. Wow, what an ending! Do you wonder now about James? Have you ever tried to contact him? Guess, you can’t catch that lightning in a jar, can you? LOVED the series, Monica! Well done. Will you do another series? Yes, Kathy, I found him. He’s happy and living on the other side of the country. He followed his dream to become a doctor, and he’s married with children. We talked once, and that’s enough. The rest is in the past. He hasn’t found you out with all of this writing? And gotten in touch? I envy you for being able to write about your youth. Its quite a step for a writing to be this open and sharing. But I know that is what draws people to you. The pure honesty that we all can relate to. It was a beautiful series and I loved every minute. i am glad James came back. If he has, he hasn’t said anything. My youth was so long ago, it almost feels like another person’s life. Perhaps I’ve just gained perspective, which makes it easier to write about. My blog followers more than doubled when I started posting this story. That alone helped me know I was on the right track in sharing this series. Monica, this series was such a gift. Thank you for writing it, for sharing this piece of your life. I wonder how many of us have a James in our life? Thank you, Val. I’m glad the story resonated for you. It was a pleasure to write, particularly this last chapter. A beautiful and bittersweet ending. I loved this series. It reminded me of some of my own lingering teenage angst-ridden memories. This one too, the “what might have been” is familiar and sweet and sad. A memory to treasure, but with time that’s passed not to dwell upon. Thank you so much for sharing. Lisa, I’m so glad you could relate. These are feelings that are universal. Seems like we all go through something like this at some point in our youth. Thanks for reading! WOW, thanks Mon. An amazing series, and some memories of my own……love what Sedaris said, right on. Thanks, Sherri. I love that your reading my stories. Means a lot to me. Happy New Year, my friend. WOW…did he know you two? Amazing parallels. I can see why that song stays with you. I admire your honesty and finding expression in your story. Sometimes I can’t post for a week or two because I’m sitting on another post that I just don’t have the courage to publish. Then I release it, and I find my rhythm again. Having released LiaJ in ’13, who knows what ’14 will bring? I think you are very articulate, warm and authentic. Only one place where I would disagree. I know you got your education. It oozes out of every pore of all your posts. You are a very interesting person, not at all provincial which is almost #1 for me. I’m overwhelmed with your kind words. I admit I was never a good student. Even through college I was more interested in dating and hanging out with friends than studying. But somehow I managed and was able to graduate in four year. The school was over my head sometimes, depending on the class, but maybe by osmosis something stuck. I credit a close friend in high school for helping me expand my vocabulary. I wrote about her once. She took me to the school library soon after we met, and showed me where the classics were located. I became determined to read them all. In reality I made it as far as “H.” Hawthorne’s The Scarlet Letter, but I sure enjoyed reading the Bronte’s and Theodore Dreiser, too. These works expanded my vocabulary like nobody’s business, and for that, I’m grateful, not only for the authors and their books, but for my friend who set me on the path to knowledge. Ahhh…and now we understand better the meaning of “lightning in a jar.” Funny Roberta Flack came out with two songs that followed each other “The First Time I Saw Your Face” and “Killing Me Softly” within a year and two years after I broke up with my James. I can relate. Happy New Year, Monica. Thank you for the gift of this read this year! Awesome work. If you haven’t already, you’ve got to listen to Billy Joel’s masterpiece of a song, “James.” I first heard it while in grad school, but it’s haunting refrain transported me right back to high school all over again. Georgette, Listen to it and let me know what you think. Ah, Monica, this is the perfect ending to your series. It’s poignant, filled with word pictures, and oh-so-honest! I think many of us can relate to how you felt about James — how excited you must have been to have that one, final tryst, but how sad you must have been when you had to leave. Of course you’ve left me wondering, What happened to James? Did he finish med school? Did he marry the girlfriend? Have you seen him since (do you want to?) They always say, ‘Tis better to have loved and lost than never to have loved at all. Maybe that’s true, I don’t know. But to lose a once in a lifetime love seems incredibly sad to me. James is a doctor. Married his girlfriend from back then, raised his children and seems to lead a happy life somewhere on the other side of the country. I am happy for him. The past is the past, and we’ve all grown up and that is truly where this story ends. Everything happens for a reason and, like you, Debbie, I am happy on my own. Beautiful, Monica. Makes me choked up. The part about how when you are young, you think you will find that kind of love again… But sometimes we never do. Thank you, Michael Ann. I’m so glad you caught up with the story. Maybe such love doesn’t come around again, at least not for me, but at least I have me memories. A beautiful series Monica that’s been written with feeling from your heart and your soul. Youth is often littered with untaken chances and regrets are strewn about like confetti in the wind. We can’t go back in life, we can’t correct mistakes, we can’t retake missed chances. We can perhaps try but we will never know if the outcome would be the same as it would have been then. All we can do is remember, how it was then, how it perhaps could have been and how it is now. Robert, thank you. Thank you for being a consistent reader and leaving your thoughtful comments. Thank you for your dry humor that often enhances my posts. Happy New Year, friend.